Shandor Remete, Hungary-born Australian yogateacher, is widely known in the world, even though he keeps aloof from "mainstream yoga". His own style of "Shadow Yoga" resembles a mixture of asanas with employment of vinyasa, dynamic exercises from marshal arts, Thai Chi, and traditional Indian dance. He proceeded a long path of learning body and consciousness development practices. Shandor dedicated many years to studying under B.K.S. 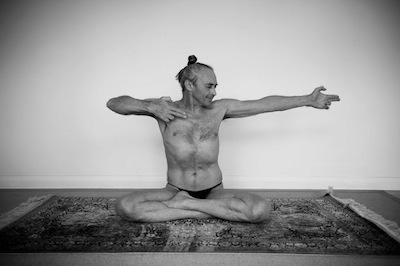 Iyengar in Puna, practiced Ashtanga Vinyasa with Mark Darby in Australia, and practicing Japanese art of sword and Chinese techniques of Shaolin monks. Besides this, he learned how to work with marmas in Ayurveda, and deepened his understanding of postures in ancient Indian dances. This interview was taken in Moscow, in Shandor's room at Beijing Hotel, during one of his workshops in 2004. It was published only in Russian then, but there are some interesting opinions in it, which I believe, are worth spreading for the international audience. It is a real gift to interview such a teacher as Shandor. Such teachers are unique. Teachers who know what they are talking about, trying to share with people ideas of real yoga. This is not an easy task, as in its full variant (even in its different versions) it is not very popular … This small deviation is an introduction. As for the interview Shandor accepted our offer with pleasure despite of organizers’ assurances that he is too short of time. “I am totally open. You can ask about anything” … Though during the interview it was not always clear, who is asking questions … “What is ujayi? What does it mean? What for…” However, you’ll read about all this later. In a word, a list of prepared questions was put aside, and we were just having a lively and extremely informative conversation. Enjoy it. Ganga. This is not your first visit to Russia. Your vision of yoga is appreciated by Russian people as you explain asanas very deeply. Besides, those who are practicing martial arts demonstrate a big interest to your style. Where does this connection come from: yoga and martial arts? Shandor. Yoga and martial arts are the same, aren’t they? They have something in common. They have the same source. Ganga. Did you practice asanas only or martial arts as well? Shandor. I have started to practice yoga with my father when I was six years old. I was growing up and continued practicing. Certainly in youth I was studying martial arts as well. But when I have returned from military service in Southern Vietnam in 1971, I became more concentrated on yoga. In how yoga is presented in the modern world there is a common difficulty which is a lack of preparatory work. Everyone speaks about disclosing this or that but only few people are really interested in information contained in ancient texts. For example, “Dhyana Valkya” speaks about meditation. In chapter 9 it is said that while a practitioner is not familiar with the system of marmas , nadi and vayu , he should leave meditation aside. It is a particular shloka, verse 22. Other ancient texts speak about the same. They do not say much, but almost the same words we can find in “Vasishtha Samhita” or “Yoga Kandava Vasishtha”. But none of those whom I was studying from knew about it. When I came to India for the first time I could do much more than a basic level. Nevertheless it was difficult for me to accept certain things. Yoga has borrowed a lot from various spheres of life: from the kingdom of plants and animals, from martial arts, but martial arts in their turn borrowed a lot from yoga. At the same time, when you come to yoga classes and do fighting stands, it does not bring any result. In martial arts stands are used for developing strength, releasing peripheral energy and increasing the circulation of vital force in a body. For this reason they are dynamical in its nature and demand a well coordinated activity of the external body. All is directed on removing obstacles that block movement of the vital force. In yoga classes which I’ve attended, nothing similar happened. So, whoever has borrowed it from martial arts, they do not understand absolutely what was borrowed. People borrow something not understanding what it is based on. So I have decided to make a research. I was practicing ashtanga vinyasa when nobody yet knew what it is. Those times Pattabhi Jois was training only five-seven western people and one of my close friends was among them. I was studying from him. I also was studying from B.К.S. Iyengar. I was getting a grasp of texts, but what they were talking about I did not find in any of the schools. So I have started to make a research. Ganga. Did you understand that the approach is not so intellectual, or was it your body that said to you that something is wrong? Shandor. When something does not happen, it does not happen, and you precisely know it. Everyone speaks about energy (power). Thick books named “Power Yoga” are written. But when you come to Shaolin, Shaolin monks do not speak about energy, they possess it. Many of those who practices yoga, possess good flexibility, but only few understand how their internal energy works. How to direct the energy, how to use it for yourself and for healing others? Except for the few, the whole world of yoga is simply engaged in conversations. I have started to ask these questions. I was putting maximum of efforts but could not get expected results. I began to give more attention to theoretical information contained in texts. I have met experts on marmas in South India. I have met many other people as well. Certainly, time spent with Iyengar was very valuable as he pays lots of attention to details. It helped me to better understand how to use marmas. Marma is an obstacle. There are 108 connections in a body that generate obstacles. When practice is done correctly, there are no marmas in a body. The word marma, mrth, means death. If you know how to use body correctly, if you know how these points are arranged, then you know how to move so that not to form an obstacle in a body. There are many ways of influencing marmas. One of the main causes that form marmas is fear. Psychological fear interferes with movement of energy in a body. Other important thing is how the person feels himself as an individuality (how he presents himself). Position of a body is important, not during the practice but in daily life. Everyone has habitual manners to sit, to stand, to move etc. This forms certain obstacles. Certainly, obstacles arise due to falls or blows. The way we use our body during certain activities influences marmas too. Knowledge about marmas helps us to learn how to move correctly, and to understand how we should not move. It gives us knowledge of two contrasts meaning that it gives us space to distinguish what is what. If a practitioner does not understand it, he faces “clamps”, the one who is more arrogant, damages his knees (himself), anklebones, or gets backbone or neck injuries. If neck is damaged, there is a blood problem as well as kidneys’ problem. But people do not realize it. Ganga. You often say about the movement of energy in a body but how a person can distinguish real movement of energy from just arising sensations, pricking, etc. Shandor. It is impossible not to distinguish movement of vital forces. If you do not know how to arrange your body correctly, nadi would not work. There should be preparatory work done before yoga practice itself. When you fulfill difficult asanas, do you understand where energy is directed, what you focus on? If you do not realize all this, what for do you do these asanas? First, a person should be prepared and opened. That is, if the body is blocked by various points from periphery, it is necessary to learn how to manipulate them in one movement, not destroying what you are, but on the contrary, improving it. Understanding of correct position is necessary. For good circulation of vital force a form without obstacles is needed and good work of nadi. There are very talented people, they are very flexible by nature, but it does not mean, that nadi work. We speak about the ability to be aware of each sensation … if we follow the way described by Patanjali. Nadi open from feet. If we know marmas we know about the importance of flexibility and work of anklebones, wrists and necks. This is an objective of preparatory work which is not given nowadays. Everyone needs to do preparatory work before asanas, as even talented, flexible people have imbalance in a body, meaning that they are mobile only in certain parts of a body. In texts the word atah is used to designate this stage and it means “now” or “then”. This word which can be found in a beginning of any new topic in texts is very often ignored. This word means “what takes place (happens) before” and asanas come only after it. But it is never mentioned what was before asanas though a previous action is always present. One always precedes another. For example, to meet with me, you first needed to phone to the organizers of the seminar. Here it is the same. Preparatory work that precedes asana takes seven years. And preparatory work is based on Anand Tandava of Shiva. I have heard talks about Shiva’s dance. All “internal” arts are based on it: Bharat Natyam , Kathakali , Kalari and Yoga. All this opens and clears channels of a person. He wears beautiful attire. Each part of a body where there is a blocking of energy flow is covered by an ornament. We can seize energy through them. Anklebones where marmas are situated are responsible for blood. Heavy ornaments are placed on sacrum, neck, head, and also on humeral joints. It means that these areas are extremely important for a free flow of energy. Further Shandor explains poses of the dance. Look, movements are very simple, as everyone wants to breathe and to be alive, to be hot. If you learn these movements you can get very hot. You do not fix these positions for long, and each movement is done with only one breath. Movements of feet, hands are accurately coordinated and done on one place. They are not easy to remember. These are the first 26 movements out of 108. Everything I teach is based on this. These sculptures decorate temple collars for about 3000 years. People talk a lot, but nobody pays attention to it. This temple has four pairs of gates and they contain all 108 positions of Shiva’s Ananda Tandava. Shiva gave many dances, but only these positions were fixed. All dancers, masters of fighting arts and noncommercial yoga teachers of Southern India necessarily study them. It is absolutely not easy to bring your foot to shoulder, not touching the foot, but here there is a preparatory movement for placing a foot over a head. If you look attentively it becomes obvious that this movement grows from a simpler one, and becomes a result of correct activity and proper flow of vital force. It took me a year to learn these 26 movements. It is uneasy not even to execute them, but just to remember: to remember a position, movement by hand, by foot and transition from one position to another. Definitely, it heats up a body extremely. Shandor. Three disciples of Krishnamacharya contradict each other. What does it mean? It means that Krishnamacharya was teaching them according to their personal needs. Now it is all reduced just to exercises, but the teacher should consider psychological condition of a disciple along with physical condition. A person should be necessarily cleaned out first. Ganga. Do you mean shatkarmas? Shandor. Shatkarmas help to gain control over undesirable actions. Shatkarmas is only the beginning, a physical level. Real purification comes with asana. Before that you should clear your habits, otherwise they pollute your practice. Ganga.But there is an opinion that when you start practicing, practice gradually changes your habits. Shandor. No. The word asana consists of two parts: asan – “a mouth”, a – “a place for sitting”. When secrets are being revealed, both from outside and from within, you should remain motionless, it becomes asana. The word samasthana is more appropriate for description of a body’s position. Sthan means “to have”, sama means “equal”. There is a word combination kayar samasthana gatir kriya where kaya means “a body”, sama - “equal”, sthana – “to have”, gatir – “24 minutes”, kriya – “a process”. It says that any position during the process should be kept for 24 minutes. For 24-26 minutes energy flows through the whole body. There is just a little difference from the days, isn’t it? There is also an assumption that prana should be kept for 5 gatika which is about two and a half hours. We interact with five layers of consciousness from the roughest to the thinnest one. Work with a body should be done in a way that it concerns five layers of energy. Then in the end of two and a half hours you are vibrating at all levels. Now you are one person, instead of five different people living in one body. Very often this is not taken into consideration. To achieve this condition you should clear your actions and your thinking. If you will come into this room and say: “I want to do asanas” - your mentality is not changed – and asana will not change it. Probably it will in 15 years, after 15 years of mistakes. In the south of India where yoga have not yet become so commercial, I do not know anything about the north, but in the south first of all a disciple is being properly cleaned. You do something like pancha karma in Ayurveda, or marma vayudji. For three months you should keep to a diet, you are given massage, affecting your marmas, energy flow; you are given certain types of medicines. After that they show you one or two movements, gradually building you up throughout seven years. It is the same as in Tai-chi and Chi kung. Shandor.What is strength? Unobstructed flow of vital force in a body has nothing in common with muscular power. It is a directing power through consciousness, which is absolutely different. For this purpose we have to be able to feel. When we use muscular strength, skin becomes tense and we lose sensitivity of skin. One of my friends met a Chinese master of the Chi kung, and asked him to teach him. Within three years he did the simplest rack, holding it for half an hour, then another rack and then one more. If you try to make one of similar racks at least for five minutes, you will immediately feel that you have feet and that they are connected with your sacrum. He shows photos from Shiva Tandava. Here is a variant of Natarajasana, but a foot is raised there by itself without the help of hands. Shandor.It should not bother you. You do the first variant, the simplest, then the second one (demonstrates), where there are more hand movements, and these movements are accurately coordinated with movement of feet. Here a foot is already higher, that renders greater influence on foot, anklebone and feet soles. Feet soles open us to the energy of the earth. Important marmas are located on them, as well as on our palms. On feet soles and palms we have points connected with heart, lungs, and sight. Two nadi from eyes and ears go to thumbs of each foot. Heel controls muscular tension of a body, cramps, not speaking about kidneys. Doing simple initial movements you not only achieve clarification but also disclose channels, it allows vayu, a force motivating vital energy, to flow freely. Today everyone speaks about breathing. A beginner comes, he is told: “Breathe”, but how? And he breathes incorrectly for the next fifteen years, and this habit is very difficult to be changed. Everyone uses the term Udjaji but no one knows what is behind it. Where the sound is being created, why the sound should be done in certain places and what it gives to us. So physical ability is important and wonderful, but knowledge of what you are doing is absolutely different story. Shandor.Not simply feeling, but knowing intellectually. There are two types of consciousness: primary consciousness and processing consciousness. Processing consciousness which is considered to be the lowest considers training. Patanjali also mentions it, speaking about dreams: the lowest consciousness requires sleeping. And he assumes that gradually we should surpass sleeping. But training is necessary for us. Thus a distinctive ability is lying between contrasts. The knowledge of contrasts gives us a space and possibility to distinguish, to make a correct choice of what we do in order not to create negative karma. Why udjaji breathing is important? How does it heat up a body? If we do not know it, why we do it, why we speak about it or about energetic locks if they do not happen. If to get a grasp of the information it becomes clear immediately, how poor yoga has become. Udjaji is carried out due to contraction in a basis of a throat. 90% of those who breathe udjaji produce a lot of noise in a throat that causes dryness of nasal bosoms, eyes and brain. Heat flows to brain and people become very emotional. But if contraction is done below and connected with a navel which is responsible for correct inhale and exhale then the sound which comes out a vocal box, resounds down the whole body. During inhaling it happens easier, as a breath flows from top to down. But it is difficult to keep the sound in the bottom of a throat while exhaling. The reason is that the sound appears due to contraction, contraction creates heat. This contraction and sound have direct influence on a pericardium. A pericardium raises or lowers temperature of blood which is pumped through a heart. So udjaji influences blood temperature, lowering or raising it if it is carried out correctly. Too hot or insufficiently hot blood may become a source for many problems. The one who practices yoga learns how to regulate blood temperature and to adapt it. 64 marmas regulate blood directly. Well coordinated movements of certain parts of a body promote breath circulation in a body that influences blood and body temperature of a person. Ganga. Did your father know all this? You were living in Hungary, weren’t you? Shandor. Yes. My father has started to practice before the Second World War. When he was on his “holiday” in concentration camp in Siberia, he had enough time for practice. He began to learn yoga from two Indians in Budapest. Ganga. Did you begin practicing with him; did he teach you a lot? Shandor.I began to do yoga with him accidentally. He never showed anything to me intentionally. Every day approximately at the same time he retired in his room. Once I took courage to look into his room and saw him standing on his head. I was intrigued. I sat down next to him; he did not say anything, just asked me to close the door. From that day I was coming to his room every day. I simply started to copy him. Once I could not resist my confusion and asked him to help me. That was the first time he has touched me in asana. After that he was helping me only when I asked him about it. It was very wise of him to leave various photos and books for me. Thus, it has promoted my development. Ganga. What do you think, is it possible to achieve higher stages in yoga without having a Guru belonging to a certain lineage? Shandor. Who is the highest Guru? It is considered that the highest Guru is the one who gave yoga - Shiva. If we read the word Shiva from its end it turns into Avish, which means “to breathe”. Breathing is closely connected with soul – “dah” in Hungarian, spirit. Certainly, we need certain guidance. There is an interesting story about Prahlada whose father was killed by Vishnu, but nevertheless Prahlada was very fascinated by Vishnu. He prayed Vishnu to appear to him every day. Vishnu loved this boy as he was very sincere and betrayed. Once Vishnu appeared to him again and told to the boy: “I can come to you any time, but I cannot act instead of you. I can give you a correct direction, you should do the rest”. When a person is ready, a guru appears. I had fine teachers. I have learnt much from my father, I took a lot from B.К.S. Iyengar, especially, how to look and how to see correctly. Yes, I had some basic questions that nobody could answer. So I have continued my way and investigated all these questions. I was trusting to what was prompting to me from within. I have heard the word “marma” for the first time from Iyengar. Once he has uttered it during one of his classes in Puna. I approached him after the class and asked what this word means. He told me: “It is a certain point”. He did not say anything more. So I was trying to learn it continuing my way. I found out that even ayurvedists do not understand marmas. Then I started to study together with sittars learning Siddha medicine instead of yoga. Though yoga is a part of siddha medicine, it is not a kind which is usually given. I met marma vayuji, teachers of the science about marmas. It was not easy, as they would not work with you, if they do not feel favor for you. I have passed thousands of kilometers through the territory of India by taxi to meet with one Guru, but he has turned out, practically not having a look at me. I did not feel anything to him either. When I met my fourth teacher, his face begun to shine, as well as mine, he took my hand, invited to his house, sat me down and I was observing him for the next six hours. Then he looked at me, and did some actions on me though I did not ask him for this. This is the way we unite, at heart level, training happens only at heart level. So I was taught marmas. Then I understood, that actions and manipulations which are carried out on you by other person, differ from actions carried out independently. The first lesson on marmas consists of a prelude to asanas and asanas themselves, the second lesson consists of pranayamas. With the help of pranayama we gain control over energy. In the first case we use physical energy to direct energy through marmas, and in the second case we learn to control energy mentally. It is called kumbhaka. There are two types of kumbhaka - sahita and kevala. At first it is necessary to seize sahita and gradually come closer to kevala kumbhaka. Kevala and kayvalya are the same and mean “cutting off”, “isolation”. Patanjali mentions it as kumbhaka in the fourth part of Yoga Pradipika and as kayvalya in Hatha Yoga Pradipika. Both variants say about a breathing delay. In his chapter one Patanjali mentions some ways of achieving Samadhi, and one of them is a long exhale which is not followed by an inhale. It is a way of achieving Dharma Megha Samadhi, he does not give this name, but means exactly this state. Ganga. This visit to Moscow is not the last one, isn’t it? Shandor. Certainly not, I will definitely come here next year too. Ganga. Perhaps, you have some wishes to those who practices yoga in Russia? Shandor. I wish them successes in practice and awareness of what they do.